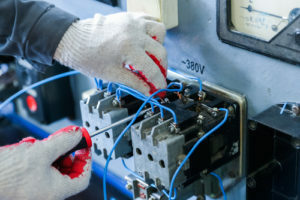 Whatever your business or commercial enterprise may be, the installation and maintenance of a smoothly-functioning electrical system is an absolute necessity for keeping the lights on, both figuratively and literally. When it comes to commercial electrical installation and commercial lighting replacement services, Ocean Coast Electric has you covered. Our team of seasoned electricians is highly trained in providing a vast array of services relating to commercial electrical installation and maintenance, making sure that your place of business is properly taken care of. New Construction. We can install an electrical system for your new building from scratch. Single Phase, Three Phase Panel, and Wiring. Our team can install a variety of different commercial electrical installations at different phases and voltages. Troubleshooting and Rewiring. Are you experiencing unexpected outages or other issues? We’ll identify the problem at its source and work to resolve it. Electrical Drawings & Plans Review. Ocean Coast Electric can devise a blueprint of our plans for your operation that will not only facilitate high-quality electrical installation but can also make it easier to conduct accurate field inspections that may save you from incurring violations.